I am a Veggietales fan! The Biblical story of David and Goliath, with a cast of vegetables. Larry the Cucumber: [singing] I need to go to the bathroom! Bob: Uh, Sven, you can stop singing now. 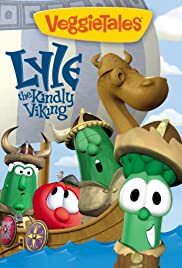 This is a great veggietale.The viking wife song is just the tip of the iceberg.The utter silliness,yet classiness(what other show can incorporate gilbert and sullivan and Shakespeare with out dumbing it down or seeming stupid)Omlet is hysterically funny AND accurate.My mother teaches English in high school so she knows lol.The silly song,while different,is addicting and very very cute,I never knew it was parodying Forrest gump.Now while I'm sentimental for qwerty and the bible verse,this was still good.It had good Christian values,but was not stuffy or boring, much like all the veggietales(Sat morning fun)like every veggietales. The one moment that keeps popping into my mind is Archie sitting in his armchair with a faux fire and his leather robe.